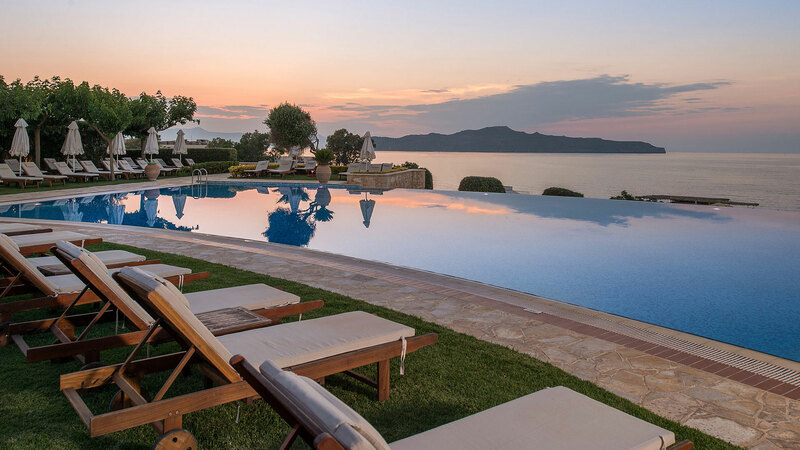 For all those that believe Crete to be a perfect holiday destination, you will be pleased to find that there is a hotel that offers all the facilities you need for a relaxing and regenerative holiday. 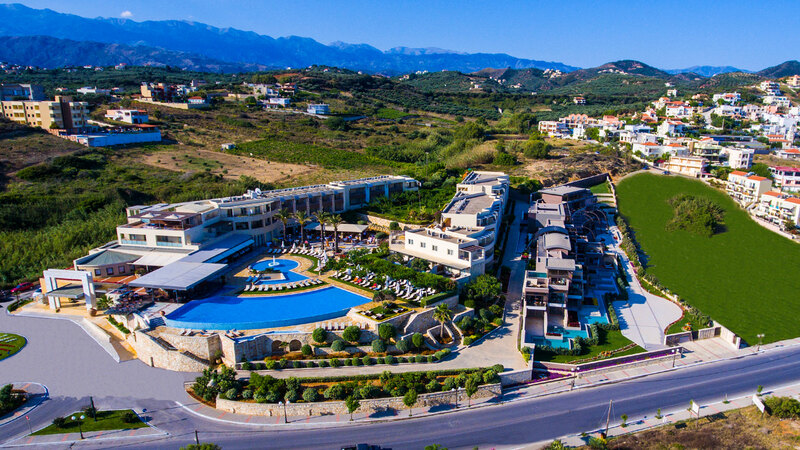 Situated at the entrance of the magnificent beach of Stalos, and only 6 km from the fabulous city of Chania, Cretan Dream Royal provides you with all the comforts creating the ultimate place to unwind and and earn an everlasting place in your heart. Its strategic location is one of its main advantages. 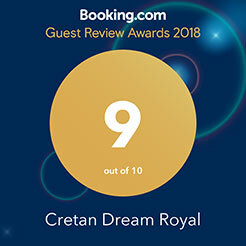 Cretan Dream Royal, is a hotel complex whose management reflects its experience in the hospitality industry and its main principle to satisfy fully the wishes of its customers. Your holidays on our premises will be for you a sweet everlasting memory. Decorated to very modern standards and offers stylish and comfortable accommodation. Unwind and enjoy the breathtaking views of the sea and mountains. For ultimate relaxation relax by the pool with a refreshing drink. Feel at home and enjoy the exceptional service and hospitality. Make the most of your honeymoon enjoying the comforts of the Bridal Suite. Combine your family holidays with absolute rest a perfect family destination and children-friendly hotel providing a children’s play area. Taste Cretan delicacies and cuisine savoring pure Cretan products throughout the entire day. 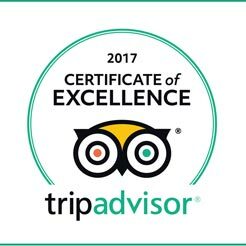 Authentic Mediterranean and international buffet breakfast and dinner. The buffet breakfast includes pastries and bread, Greek yogurt with honey, homemade jams, cereals…. Modern and simultaneously idyllic setting for cool cocktails throughout the day as well as for pre-dinner drinks in our stylish cocktail bar…. Cretan Dream Royal is perched on a small hill, with direct access to the beach, the hotel is located in Stalos, between the city center and the popular cosmopolitan areas of Agia Marina and Platanias. The hotel consists of 80 suites fully equipped with modern amenities and they all have breathtaking views of the beach or the majestic White Mountains. 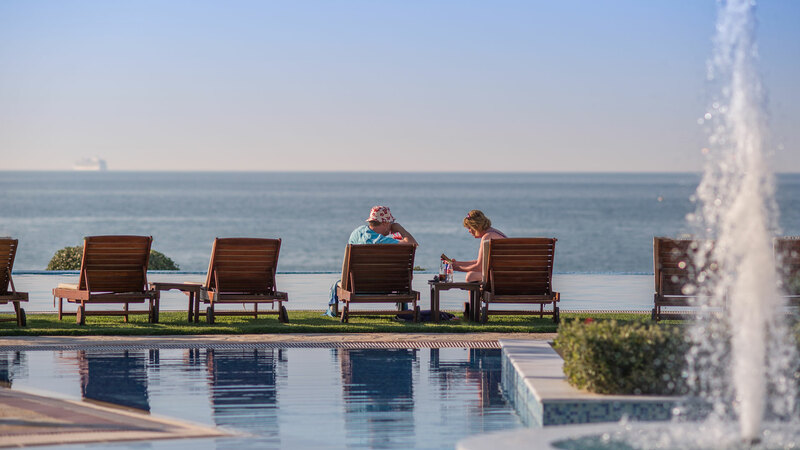 Enjoy the sun, the f the sea or the pool and replenish your vital energy with the best Cretan cuisine at our fantastic restaurants which offers Cretan and international specialties. Explore on foot the most popular fantastic beaches nearby. 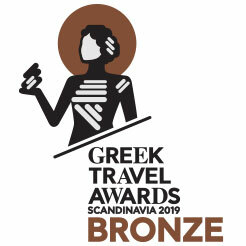 Use the regular bus service as the bus stop is right in front of the hotel for more distant excursions with each bus arriving within 10 minutes from the old town of Chania. Would you like more luxury? 3 superior suites, exceptional architecture, each with their own unique style and decorated with natural earth tones stylish and modern materials used to create a unique space of luxury and elegance. Accommodates up to 2-4 persons 36 sqm, with a private pool, one bedroom with a double bed, living room with two sofa beds. 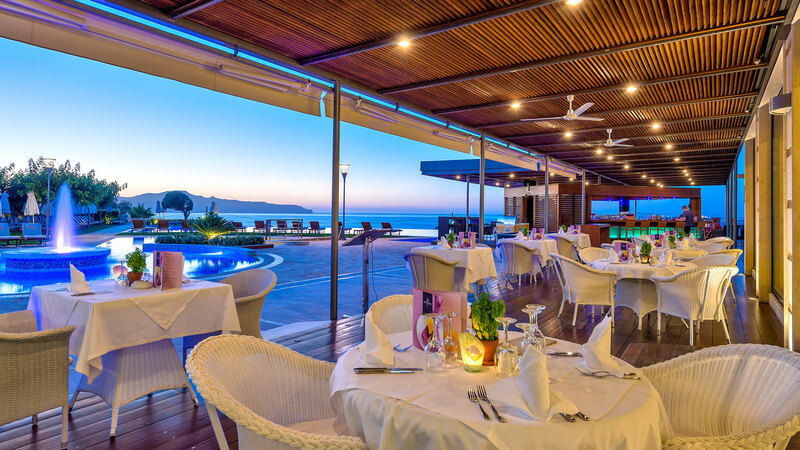 Cretan Dream Royal offers excellent options for your stay, relaxation, good food and entertainment. Indulge yourself in the charm of the peaceful environment of minimalist elegance and comfort in the communal pool. The hotel’s large swimming pool, which overlooks the endless blue of the sea, allows you to sense the feeling of freedom and relaxation to the maximum extent. 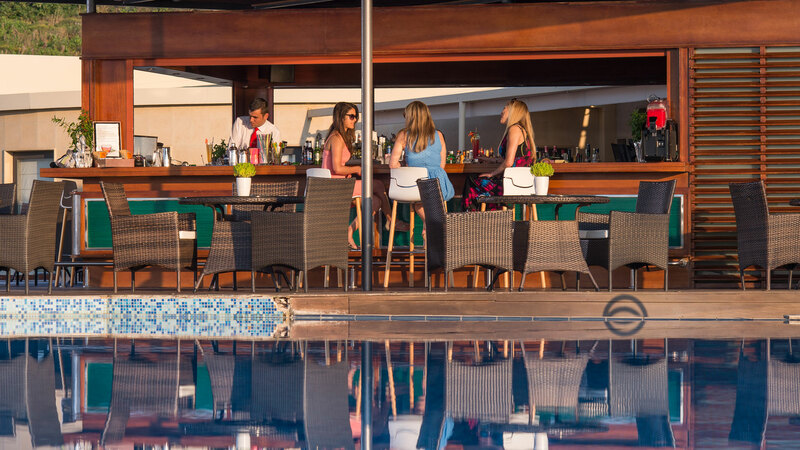 Enjoy the sun by drinking your favourite cocktail at the pool bar or having your meal at the a la carte restaurant “Muse”, which sits next to the pool with its characteristic fountain. For luxury lovers, choose from 3 Superior Suites of individual architecture each with its own style and decoration with earthy and modern materials creating a space of distinct luxury and elegance. Each superior suite features its own private swimming pool, with touches of excellent marble, wood and natural stone. 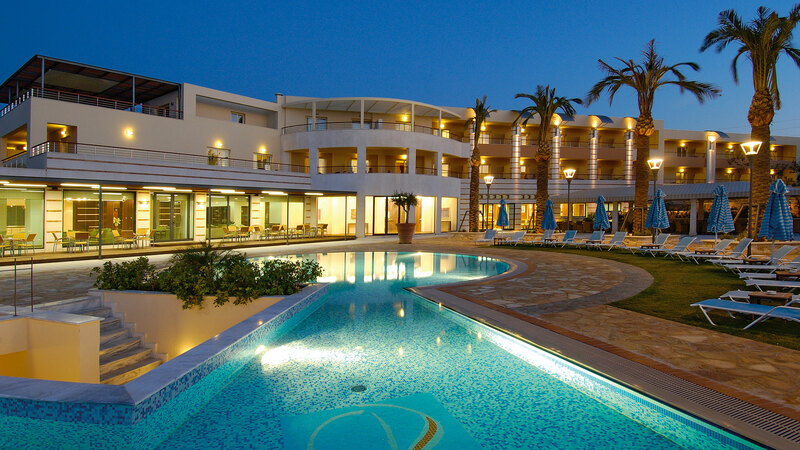 The Cretan Dream Royal Hotel is ideal for those who want to create a memorable family holiday. Parents will have the opportunity to enjoy great services and facilities, while children will have the chance to play in the hotel’s playful playground along with ample activities. At Cretan Dream Royal, the care, entertainment and safety of your children are a priority for us. To ensure that you can relax knowing that your children will have a beautiful and carefree vacation. In the beautiful and colorful facilities for our little friends you will have the opportunity to play with your children and spend quality and creative time with them. We take care of the absolute safety of your children, since all the toys are plastic and wooden, and all the space is fenced and the ground is covered with grass.